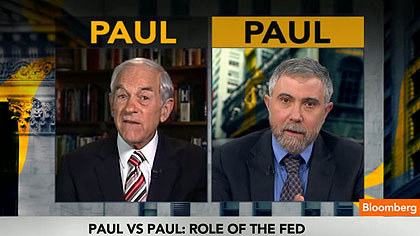 Paul Krugman “debated” Ron Paul yesterday, and afterward he had an epiphany: debates are useless. Think about it: you approach what is, in the end, a somewhat technical subject in a format in which no data can be presented, in which there’s no opportunity to check facts (everything Paul said about growth after World War II was wrong, but who will ever call him on it?). So people react based on their prejudices. If Ron Paul got on TV and said “Gah gah goo goo debasement! theft!” — which is a rough summary of what he actually did say — his supporters would say that he won the debate hands down; I don’t think my supporters are quite the same, but opinions may differ. Krugman is right, but I think he’s also missing the point here. Wars of ideas are typically won in print: in journals, in books, in magazine articles, and in monographs. The audience is fellow professionals in your field, the language is often technical and abstruse, and you keep score by counting citations, being invited to conferences, and amassing disciples. Public debates, including their gruesome modern variant, the three-minute hit on cable TV, aren’t about that. They’re solely designed to influence public opinion, and you keep score at the ballot box. Nobody cares if Ron Paul is technically right about the Romans debasing their currency, and nobody cares whether that really has anything to do with the modern global economy. All that matters is whether he’s found an analogy that moves a few of the rubes to his side. Truth isn’t just an obstacle in public debates, it’s a handicap. If you want to increase your understanding of a subject, public debates are worthless. But that’s because that isn’t their purpose. Their purpose is emotional appeal, and understanding actively gets in the way of that. Ron Paul already knows that. I hope Krugman does too.